For over a decade, the Girlfriend Ride has brought hundreds of women together to ride bikes and support a community cause. The Girlfriend Ride returns in June 2019 to benefit the Columbus Bicycle Co-Op and Friends of Columbus Animal Care Services, along with their partner agency, Columbus Animal Care Services (CACS). The Girlfriend Ride isn't your average bike race. It's a ladies-only event designed to empower you and the amazing women in your life. Join hundreds of women from 5 states! Get your crew together, air your tires, and enjoy various ride options. Register for the 15-Mile Pixie or the 25-Mile Home Perm! The bike route begins and ends at Simmons Winery, so you can rest assured that there will be beautiful scenery to view for miles. Girls run the world, or at least they run the Girlfriend Ride. 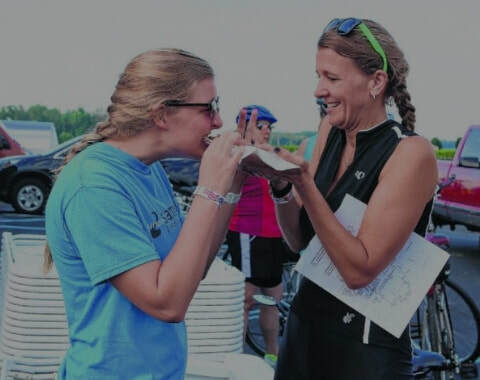 Experience a female-centric vibe at one of the most popular ladies-only bike races in Indiana. What better way to celebrate a race finished than with a glass of wine and carbohydrates? Refuel with your besties and take lots of selfies. You'll deserve it!